London, UK: ImproveWell LTD announces the launch of its new Enjoying Work platform, pioneered by East London NHS Foundation Trust (ELFT). The new functionality is available to all organisations as an add-on to the core ImproveWell platform. The Enjoying Work add-on has been designed as a digital solution to ELFT’s high priority Quality Improvement project focused on reducing staff burnout and improving enjoyment at work. The development of the Enjoying Work add-on was also supported by UCLPartners. In 2017, the Institute for Healthcare Improvement (IHI) published its Framework for Improving Joy in Work. With increasing demands on time, resources and energy, in addition to poorly designed systems of daily work, healthcare professionals are experiencing burnout at increasingly higher rates with staff turnover rates also on the rise. Burnout leads to lower levels of staff engagement, patient experience and productivity, and an increased risk of workplace accidents. Lower levels of staff engagement are linked with lower-quality patient care, including safety, and burnout limits healthcare providers’ empathy; a crucial component of effective and person-centred care. IHI believes an important part of the solution is to focus on restoring joy to the healthcare workforce (source: IHI Framework for Improving Joy in Work1). Since Autumn 2017, five prototype teams at ELFT have been using Quality Improvement to enhance joy in work. These teams represent some of the different types of work environments found across ELFT including: highly mobile staff in a district nursing team; geographically dispersed staff in a primary care psychology service; geographically centralised staff in a community mental health team; inpatient staff on an adult mental health ward; and a corporate team at Trust headquarters. The early results generated from the prototype teams’ Enjoying Work projects have spearheaded the development roadmap for ImproveWell’s Enjoying Work add-on. The Enjoying Work add-on allows organisations to build tailored surveys, with multiple question and answer types, and deliver them via the ImproveWell mobile application. 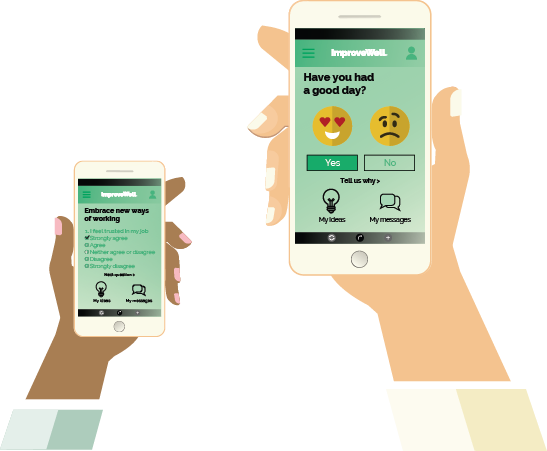 A “Good Day Measure” survey, complete with animation, allows staff to describe their day, with results presented in interactive charts via the mobile application and ImproveWell’s data dashboard. The project team functionality allows organisations to run multiple Enjoying Work projects, tailored to team themes and objectives, with the ability to suggest improvement ideas and monitor the progress of implementation. 1. Perlo J, Balik B, Swensen S, Kabcenell A, Landsman J, Feeley D. IHI Framework for Improving Joy in Work. IHI White Paper. Cambridge, Massachusetts: Institute for Healthcare Improvement; 2017. (Available at ihi.org). A motivated workforce leads to better patient outcomes and improved financial performance. The ImproveWell platform uses a smartphone application that empowers staff to communicate their ideas for improving care directly to senior management. An intelligent data dashboard provides a proven and trusted way to review the feedback coming in from the frontline. From the ward to the board, everyone can make suggestions to improve their workplace. For further information, please visit www.improvewell.com. East London NHS Foundation Trust (ELFT) is a provider of mental health and community services, to a population of approximately 1.5 million people, mainly across East London, Bedfordshire and Luton. ELFT aspires to provide care of the highest quality, in collaboration with those who use its services. ELFT is an organisation that embraces continuous improvement and learning. Achieving this means that ELFT has to think differently, be innovative and give everyone, at every level, the skills they need to lead change. Focusing on what matters most to ELFT’s service users and staff, and improving access to evidence-based care, will make ELFT’s services more effective, give more power to its staff and improve patient experience and outcomes. Read more about ELFT’s Enjoying Work Quality Improvement programme here: qi.elft.nhs.uk/collection/enjoying-work. UCLPartners is a unique academic health science partnership that brings together people and organisations to transform the health and wellbeing of the population. With more than 40 partners from the NHS, social care and academia, UCLPartners supports improvements in discovery science, innovation into practice and population health and focus where the need and benefit is greatest. The local focus is to support health and care improvements for a population of six million people in north east and north central London, south and west Hertfordshire, south Bedfordshire and south west and mid Essex. Beyond serving the local population, healthcare solutions developed by members are also applied across the UK and globally.